Season steaks with salt and pepper. Grill steaks, covered, about 6 minutes per side, or until desired doneness. 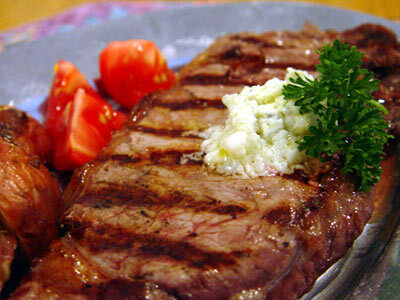 Meanwhile, blend together bleu cheese and softened butter in small bowl until creamy. Equally divide bleu cheese mixture and place a scoop on top of each steak. Leave steaks on grill until butter melts. Garnish with parsley.